Before you read on, know that I get no commission from any of these vegetarian restaurants in Barcelona for writing about them. This is a list of my personal favorites, that I have all tried myself. The ultimate. Teresa Carles is my go-to vegetarian restaurant in Barcelona because, the food is fresh and nicely portioned. It´s locally inspired but you´ll find some international favorites on their menu. And it´s great value for money. The location close to Universidad is central and it´s so cosy! I think the Scandinavian word for how I see Teresa Carles is hygge 🙂 But, I recommend reservations if you don´t want to wait in the queue outside! The swanky. The Green Spot in Port Vell is the place I like for special occasions. It´s a little on the pricier side but worth it. The restaurant feels spacious and sophisticated. If you´re looking for a vegetarian restaurant to celebrate a birthday or even a date, this is a great choice. The conscious. Flax and Kale has the same owners as Teresa Carles. You see the same attention to detail and cosy ambiance here. It´s a flexitarian restaurant, so you´ll find a few fish options on their menu. I went there with Caroline from Youlightup who is lactose and gluten intolerant and has a nut allergy. If you are interested in how she eats when she travels and her life at home, check out her blog. The casual. Vegetalia runs several vegetarian restaurants in Barcelona. I remember sharing a delicious tasting platter on a sunny terrace in the Gothic quarter. Great for a quick lunch during your busy day of sightseeing. The mid-day. Sopa Boronat is located in the @22 business district and a popular lunch place for vegetarians. They offer a different lunch menu each day with several healthy options to choose from. Take-outs are available, too. And in 2018 they opened a vegetarian Sushi place next door! So, imagine how thrilled I was when I discovered there is a vegetarian Sushi restaurant in Barcelona! And it´s soooo good! What are your favorite vegetarian restaurants in Barcelona? There are a few I still haven´t tried. So, let me know if you have any hot tips in the comments below. ooh I have another recommendation! Although I don’t remember if it’s a fully vegetarian restaurant in Barcelona lol. But it’s called Brunch & Cake and it’s SO good! I mean, I remember the name even though I ate their two years ago, so that had to be a pretty awesome meal. So glad this is a helpful guide for you Josy! I wish you a wonderful stay in the city with your family next time you come back. Would love to hear how you liked these vegetarian restaurants! Love exploring new restaurants and vegetarian sushi is my favourite so thanks for the recommendations!! I’m not a vegetarian BUT I’ve been to some awesome vegan restaurants that blow regular ones out of the water. I also find that in Europe it’s harder to come by vegetarian options so this is such a useful guide. totally agree with you, especially in Barcelona. There is meat everywhere! It took me a long time to find dishes and restaurants I can enjoy as a vegetarian, so I am happy you think this is a useful guide! All look yummy, I’m not a vegetarian but sometimes go veggie as my body craves all the goodness. Would definitely stop by one of these when I’m next in Barcelona – Teresa Carles sounds like my kinda place. You´re going to love it! 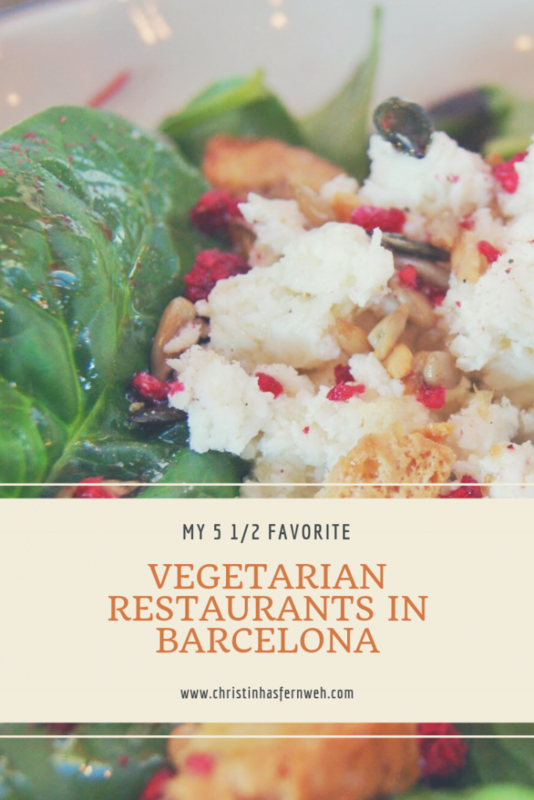 I´ve been there with several meat eaters who all said they were impressed that vegetarian food can taste so good 🙂 Hope you have a great time when you´re next in Barcelona! The food in Barcelona is amazing, although I didn’t look for any vegetarian specific options. Have you been to La Boqueria market? La Boqueria is super popular and the variety is unmatched around here. However, it´s a little to crowded for my taste. But I am sure anybody would find something to eat there that they like! I haven’t been to Barcelona yet, but this list will come very handy if I specifically crave some fresh vegetarian dishes. I’ll also be looking for some Spanish inspired flavours. A market could also be a place that offers many yummy vegetarian options. We are going to Barcelona later this year and I will definitely bring this list. Love trying local, healthy great restaurants when visiting new places! Great! Hope you’ll have a fabulous time in Barcelona! Enjoy the healthy food! Such a handy guide! I’ll be in Barcelona in the summer and I’ve honestly been a little nervous that I’ll be inundated with non-veg restaurant options, so this will definitely be useful in a few months. Cheers! Glad to be of service 😉 enjoy the veggie food and Barcelona! I heard amazing things about Flax and Kale when I was in Barcelona but sadly didn’t pay it a visit. I have to say I was guilty of spending too much time eating at La Boqueria and scouting about the best locations for churros. No shame haha.